It was a holiday last November 1 and I spent the entire day at home with my family. I read various books, checked emails and lazed around. My search led me to visit OPM website and dug into old Filipino music. I found Smokey Mountain and it brought back childhood memories. I personally like Kailan and Can This Be Love from the original group consisting of Geneva Cruz, Tony Lambino, Jeffrey Hidalgo and James Coronel. 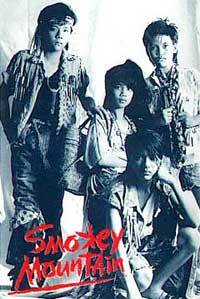 After the original group disbanded sometime in the early 90s, a second group was organized composed of James Coronel, Jayson Agangan, Chedi Vergara and Zhar Santos. This second group popularized Da Coconut Nut and Paraiso. Kailan mo ba mapapansin ang aking lihim? Kailan hahaplusin ang pusong bitin na bitin?